When I first told people I was going to be a father, most people’s initial reaction was to tell me how “you’re life is going to change.” Some people even told me that my old life was “over.” For a climber and professional mountain guide this is a tough notion to grasp. I won’t lie, I loved my life prior to parenthood, and the thought of it going away was so disheartening that I denied my wife’s pregnancy for quite some time. Denial is an incredibly effective strategy and despite watching my wife’s tummy grow for nine months, I sat in the delivery room, amidst the chaos, still not totally convinced that I was going to leave the room as a new Dad and then, Olivia arrived.One thing I remember vividly from the birth was the look of bliss on my wife’s face, and the thought in my mind: okay, what now!? 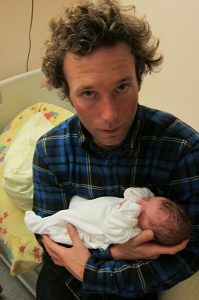 extensive research, I will even say that climbers and skiers have a distinct advantage over other parents in handling the challenges of a new baby. The three biggest complaints I heard from new parents was: the lack of sleep, changing diapers and dealing with the crying. These are things that climbers and skiers are well trained to handle and it is just a matter of adjusting to a new context. headlamp handy (we use it to have dim light in the room) and think about that trip up the Diamond later in the summer, leaving from the car at two has never sounded so easy! is very similar. First, do your best to sooth, to help, voice encouragement, shout beta, but at some point you just have to ignore. Luckily, after a nice crying fit, most newborns seem to fall asleep as if nothing happened unlike your climbing partner who will whine the whole ride home justifying why they couldn’t send. There is no question that having children is full of challenges and maybe it should be approached like doing a big climb.You leave the trailhead before dawn full of optimism, but you can never be entirely sure what the outcome will be.It is easy to get stressed over all the uncertainties and the dangers, but you’ll enjoy the experience much more if you just take things step by step. It’s not worth worrying about the summit only to miss the sunrise over the ridge. Over the past 18 years, I have stood on top of a lot of summits around the world, done some amazing climbs and skied some incredible snow, but little has compared to watching Olivia smile for the first time or stare back into my eyes. So while I adjust to the changes of this new life I will continue just as I have with my mountain pursuits: with enthusiasm and excitement for the adventures that lie ahead. Hilarious Adam! Thanks for sharing! Adam this is an Awesome article! Really fun and well written. Awesome post Adam. Way to put it in perspective! Great to hear things are going so well with you three. love it! you have a great writing voice, adam. so funny that while I was reading the end of the 4th line down ; the sentence that starts with Denial, I read it as Denali…. couldn’t understand why it didnt make sense…..even when i went back and read it again….i didnt catch the error i had made. some amusing irony in that. best wishes to you three. Super Adam. Beautifully said. Children are heart-openers to the beauty of life. This is called LOVE. I really like the lesson on the three steps how to change diapers. Next time it will make me connect with my last ski-tour. Hey, Papa, I can’t wait to get together with you and compare kid stories as well as climb. Great writing piece and many good wishes to you! Brilliant! It’s all about perspective. Nicely said. Nicely said Adam! Really cool perspective. Randomly came across this on the web. I’m about to be a dad in a few days and am starting to having those same clammy palms, salivating mouth, nervous symptoms that I get when I’m about to attempt a big climb. Thanks for the perspective, it helps a lot.